108|Contemporary and Guthrie Green are proud to welcome country musician Wayne Hancock and neon artist Todd Sanders to Tulsa! 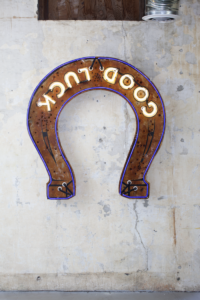 Hancock’s uncompromisingly rockabilly sound recalls the classic Americana shown in artist Todd Sanders’ neon art shown inside (and on the facade of) 108|Contemporary. Sanders will speak on his craft practice shown across the United States, followed by a show-stopping performance from Hancock. Don’t miss this amazing opportunity to see, hear, and experience a slice of old-time, Route 66, honky-tonk fun!